A rose with great flowers, fragrance and meaning, the Peace Rose as it is now called has won many awards and is such a good rose it has stood the test of time. Released by Meilland in 1945 the Peace rose is a hybrid tea rose, vigorous, tall growing and one of the most famous roses of all time. This is also a fragrant rose. Glossy deep green foliage and a history that intrigues. 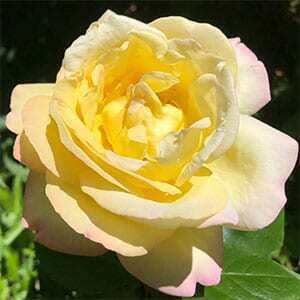 The rose was bred in the 1930s by Francis Meilland as seedling 3-35-40 and originally named Rosa ‘Madame A. Meilland’. With the invasion of France apparent to all, Meilland decided to save this rose, he sent cuttings to Italy, Germany and Turkey and it is those that reached Robert Pyle of the Conrad Pyle Co in the United States that were later named Peace. With a little deadheading you will have flowers from spring right through summer, so this is a task well worth carrying out. We suggest using a general purpose rose food such as Sudden Impact for roses with an application every 8 weeks from early spring through summer. 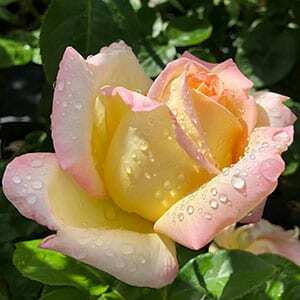 Regular seaweed fertiliser application will also help keep your Peace Rose Bush flowering freely.